Dr Shukla qualified from the University of Birmingham, School of Dentistry in 2009 and has been practicing as a general dental practioner since. He completed his vocational training in 2009-2010 in the Croydon Scheme part of the very competitive London Deanery having secured his first choice of training practices following a series of interviews. In 2010 Dr Shukla went onto complete his post-graduate examination for the Membership of the Joint Dental Faculties at the Royal College of Surgeons of England. 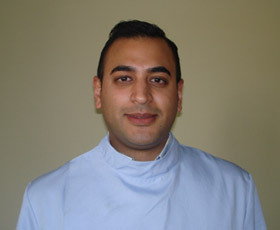 His Primary aim is to provide general dentistry at very high standards and is dedicated to provision of high quality dental care through training and development and in order to achieve this he enrolled into the Restorative Dental Practice post-graduate MSc programme at the renowned and prestigious UCL Eastman Dental Institution UCL in 2011 which he is currently undertaking. In addition to the above in 2012 Dr Shukla was appointed as an examiner for the National Examining Board for Dental Nurses, where he was committed to having an active involvement in the training and qualification of dental nurses. Dr Shukla has an enhanced interest in minimally invasive cosmetic and Restorative dentistry and is a strong believer in post-graduate education has attended numerous post graduate courses both nationally and internationally and is constantly striving to achieve perfection and continue to improve his skills and knowledge so he can offer his patients the highest quality of dental care. His strong commitment to post graduate education and development, has lead him to be recently elected Director of the Croydon Study Club/group in association with Dentinal Tubules which is a learning portal for all things Dentistry where the ethos is all about sharing learning and connecting.